June 2017: Yes, we can – our new website has been successfully relaunched! It does not only convince with a better design, functions and contents, but it has also been optimized for all mobile devices. Our homepage offers a quick impression of our (language) services and provides information on all questions of international communication.In addition to this, you can easily request an offer for your translation project. Come visit our new website! We are looking forward to your next „click“! 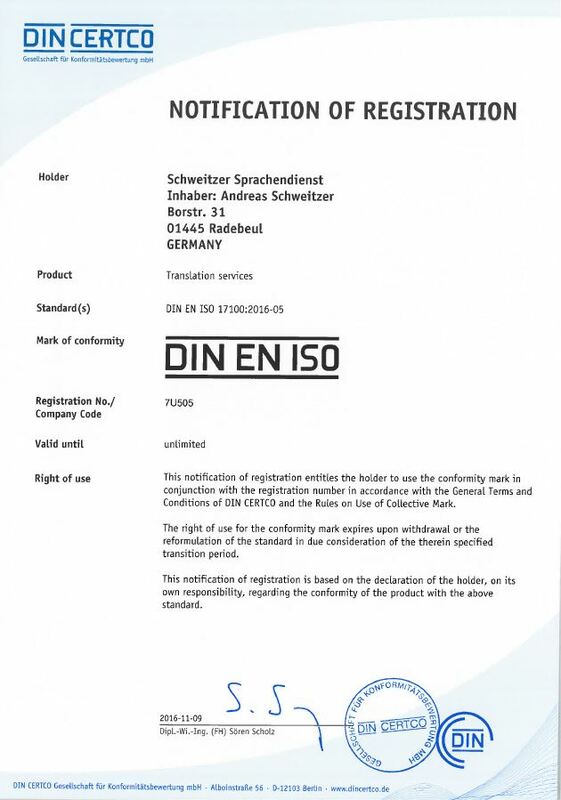 PS: Schweitzer Sprachendienst has been officially registered as a standard-compliant translation service provider according to DIN EN ISO 17100 by the certification company DIN CERTCO. You can rely on getting top-quality translations. 1 February 2017 – Dresden Airport has confirmed Schweitzer Sprachendienst to be their language service provider. An umbrella agreement for this has just been signed. Already since 1999 we have translated press releases, technical documents and advertising copy for the airport and kept their English, Polish and Czech internet presence up to date day by day. We enter the foreign-language content, press releases and flyers directly into our customer’s content management system, so that foreign-language content goes live without delay. 2 January 2017 – Schweitzer Sprachendienst has worked in accordance with the language services industry standard DIN EN ISO 17100 for quite some time. The company has now been officially registered as a standard-conforming translation service provider by the certification company DIN CERTCO. Our customers can rely on getting highest-quality translations.